Consider how the jobs report is compiled: It’s derived from two separate surveys. Each survey will be affected differently by the shutdown. One is a household survey. Government workers ask adults in a household whether they have a job. Those who don’t but are looking for one are counted as unemployed. That’s how the unemployment rate is calculated. The other is a payroll survey. The government asks mostly large companies and government agencies how many of their employees worked or received pay, typically during the second week of the month. This survey produces the number of jobs gained or lost. Suppose you’re a federal worker who was furloughed by the shutdown. The payroll survey would consider you employed. But the household survey would count you as unemployed. Because furloughed federal employees received back pay for the time they didn’t work. So for the purposes of the payroll survey, they were employed. The same is likely true for government contractors who were temporarily laid off. Many were probably paid for at least part of the time covered by the payroll survey. So the payroll survey will consider them employed. That’s why October’s job gain isn’t expected to drop much. The household survey takes a different approach: It will count both the federal workers and the contractors as unemployed because they weren’t working during the survey period. The shutdown furloughed about 450,000 federal employees in the second week of October. 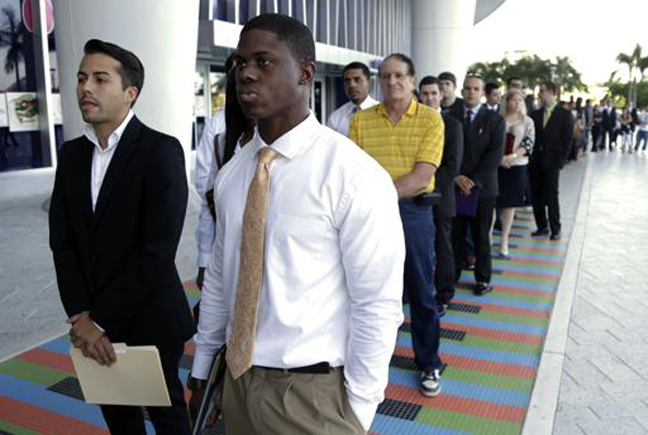 If the number of unemployed rises by that much in October's jobs report, the unemployment rate could reach 7.5 percent. There will be other distortions. Some people with private employers might have been affected. Examples would be employees of hotels and restaurants near national parks that were closed. Those workers might have been temporarily laid off, thereby boosting the unemployment rate. Yet as long as they were paid for even one day of work during the survey period, the payroll survey would count them as employed. “It is basically impossible to determine how many private-sector workers were affected by the shutdown,” economists at JPMorgan Chase wrote in a note to clients. The shutdown likely stopped the government from hiring for roughly two weeks. Goldman Sachs estimates that this fact lowered government employment by 12,000 in October. With the shutdown over, those jobs will be added over time. In addition, some workers, in both the government and private sector, might have had their hours cut during the shutdown. Their reduced hours might have boosted the number of part-time workers in October. The shutdown’s effects will be largely unwound by November. But then the bounceback from October could distort November’s jobs data. A clear picture of the job market's health may not emerge until January, when December’s jobs report will be released.